1 movement. 4 countries. 291 communities. 140,000 women. Inestimable impact. The Junior League is a volunteer powerhouse of transformational female leaders who set bold goals, open their circles, disrupt convention and change the conversation for the betterment of civil society. In celebration of National Volunteer Month (April) in the United States we pay tribute to organizations that support and value voluntarism and to the individuals who generously volunteer their time to generate awareness of important issues and effect positive change in the world. 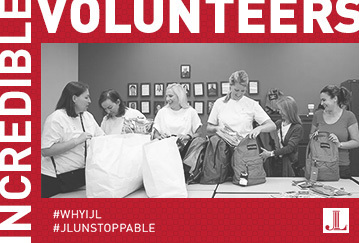 As April is also Celebrate Diversity Month; Financial Literacy Awareness Month; Child Abuse Prevention Month; Sexual Assault Awareness Month and Equal Pay Day; World Health Day and Earth Day, we’re taking a look at how The Junior League and its members have shaped conversations concerning these issues through the voluntarism/volunteer lens. Honor diversity this month by taking time to learn more about the subject by participating in the 21 Day Racial Equity Challenge. For over a decade, YWCA and its community partners across the country have come together each year for Stand Against Racism. This year, the theme is Stand Against Racism: Our Power, Our Mission, Our Future. Voting rights and civic engagement are today, and have always been, core components of racial justice work. As civil rights are eroded for communities of color, YWCA looks forward to focusing this year’s campaign on supporting full access and engagement for women and girls of color in the political process. If you are looking for additional resources, check out this Calendar of Observances from the Anti-Defamation League or this 88 Ways to Celebrate Appreciate Diversity Month from ProGroup. According to a study done by FINRA, Financial Literacy has been slowly decreasing over the years with 63% of people unable to correctly answer questions on basic topics such as interest rates, inflation or mortgages – leaving many Americans unequipped to make thoughtful decisions that impact their financial wellbeing. Bedtime Math is setting children up early to be better “number crunchers” later in life by challenging them with a daily math problem at bedtime. All is not lost for us adults either! Financial Gym is teaching anyone the basics to be financially fit and will be showcasing some of their tips and tricks on our Instagram account on April 12. What’s The Value Of ‘Volunteer Experience’? True to our mission, the women of the Junior League have a consistent track record of tackling issues that mainstream society wanted to ignore. Read about our work in AIDS, Childhood immunization; Childhood obesity; Alcohol and Substance Abuse; Hunger and Poverty.